James R. Arnold, founding chairman of UC San Diego’s chemistry department and first director of the California Space Institute whose contributions to science spanned the study of cosmic rays to the future of manned space flight, died Friday, January 6. He was 88. “Jim Arnold truly was a visionary scientist who found creative ways of looking at a broad range of problems, terrestrial and extraterrestrial,” said Mark Thiemens, Dean of the Division of Physical Sciences. A longtime consultant to NASA, Arnold helped to set science priorities for missions, including the Apollo flights to the moon. 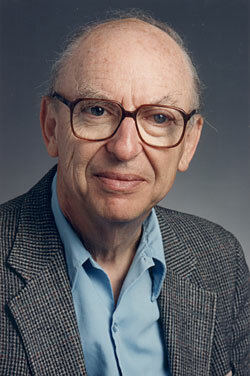 He first served on a NASA committee in 1959, just three months after the space agency was established. Jim Arnold holding rocks from the moon. In 1970, NASA recognized Arnold’s work with an “Exceptional Scientific Achievement” medal. Arnold also received the Department of Energy’s E.O. Lawrence Award in chemistry and metallurgy. Cosmic rays leave traces in meteorites as well, a record of “how long they have been a rock in space,” Arnold told a reporter for the Los Angeles Times. 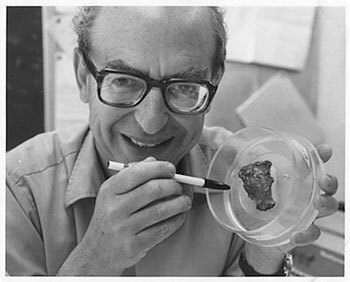 For his work on the ages and origins of meteorites, Arnold received the Meteoritical Society’s Leonard Medal in 1976. For information on how to support the annual Jim Arnold lecture please visit http://physicalsciences.ucsd.edu/giving/arnoldlecture.html or contact Melanie Cruz at (858) 822-3258 or mbcruz@ucsd.edu.